Early in every new year, I join the majority of the population in getting reflective about the past year and what I did (or didn’t) accomplish. I look at areas that need improvement and set goals for the coming months. I no longer do resolutions, as I think they are beautifully-worded and useless statements. I’ve also started moving away from “goals,” too, in the usual sense. I’ve been great at setting goals that never actually materialize. That’s not to say I don’t have any plan or direction; goals play a very small role. Later, I’ll tell you what I plan to do instead this year. I’ve read many posts like this over the past couple weeks. Writers and thinkers I greatly admire work their way through this process of reviewing the year. And they’ve done it publicly on their blogs or podcasts. Maybe you have no real interest in hearing about my year, but I need to do this in writing and in public. 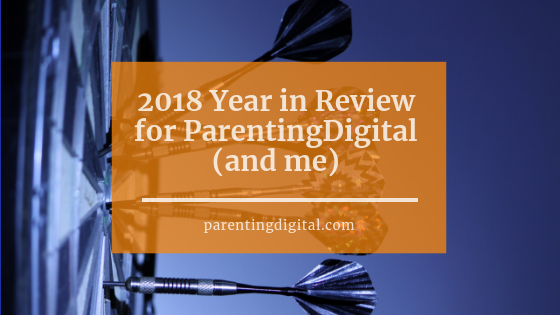 And maybe it will encourage you to do something similar, even if it’s just about your digital parenting in 2018…and in 2019. So, here goes. The wins, the frustrations, and the lessons I’ve learned on the way. Professionally, it was a full year. I started my 25th year as an educator (not possible!) and the year started with a bang. I oversee all five school libraries as a sole district library media specialist, and four of those libraries went through a complete renovation this year. You know how, when you paint a room in your house, you first have to move all the furniture out? Well, imagine that room contains upwards of 10,000 books. Now, do that four times. All in the same week. It was a busy, but exciting time to see such transformation. The payoff for all the work came in the fall, when the kids came into the new spaces for the first time. I attended a couple professional conferences, which are always invigorating for me. Even this introvert loves meeting new colleagues and making connections! Especially in a world where it is easy to have a ton of virtual “friends”, it is always better when you meet some of those people for the first time face-to-face. Sometimes these conferences are also great excuses to travel. My wife and I spent a week out in Utah and Arizona around the time of one of hers, and we visited old friends in Nashville for one of mine. Personally, I had some small wins, too. For one of them, I decided to focus on my spiritual growth by reading through the entire Bible during the year. I’d done this years ago, but my morning Bible reading had become inconsistent. I tapped into the power of social media and online groups, which reminded me that this form of technology can have positive, powerful benefits. Using the YouVersion app and a group of guys with the same goal, we read and commented our way from Genesis to Revelation. Of course, we all have things that we look back on with a twinge of regret. Goals that were not met, habits that didn’t stick, to-do list items that we just never got around to. Totally. Normal. Real. Life. My list this year is longer than I would like it to be but probably typical of most years…if I’m being honest. Here are a few of them that might encourage you that you are not alone in this reality! My wife and I did not go on enough regular dates (though we snuck in quite a few), and I didn’t do enough “breakfast Saturday” dates with each of my boys. These times, when we set aside the phones and screens and get out of the house, are such valuable moments to reconnect as individuals. For my boys especially, it’s an important opportunity to listen to what is going on in their world and what they are struggling with. And in a digital world, a world of so-called connectedness, it is easy to get completely disconnected from the ones who need our guidance and attention the most. This is the ongoing challenge for all of us, isn’t it? Use technology to connect us to others in ways we never could before, while preventing technology from isolating us from each other. I have some tools and apps in place to help me manage and limit my own phone and screen use: Freedom (app), FB News Feed Eradicator (Chrome extension), eyeCare (Chrome extension), the new Screen Time settings on the iPhone, etc. Even with these in place, I still find myself mindlessly picking up my phone, checking mail and social, and wandering around online because I forgot why I logged on in the first place. Not only does this waste precious time where I could be doing a number of other more valuable things, but it is also poor modeling for my kids. I do share with them the struggles I also have with screen overuse and borderline-addictive behaviors, as well as how I’ve tried to tame that monster in my own life. But if I’m going to guide them effectively, I also need to be practicing what I preach. It’s easy to wallow in what didn’t go well and where we’ve “failed.” But if we take on a growth mindset, then failure is simply an opportunity to learn. Any mistakes or shortcomings are just teachers to show us how and where we can improve. I need to take action to eliminate noise: This especially applies to our digital world, so I need to audit my devices and systems to turn off notifications that I don’t need. I also need to unsubscribe to a LOT of emails that I don’t find valuable anymore. And I need to find make more opportunities for quiet, whether that is going to a park or popping on my noise-canceling headphones. I need to focus on serving, not working. This is a mindset shift that I realize I need to make. It’s easy for me to think about the stuff I need to do, but I often lose sight of why I’m doing it in the first place. I try to choose a word for the year, and for 2019 my word is Serve. I’m trying to run everything through the filter of this question: How can I best serve my family, my colleagues and students, my readers, my church, and my community? If I let that question guide the things I put on my to-do list and calendar, I think I’ll avoid the trap (mostly) of doing tasks just for the sake of “doing work.” And I think I’ll enjoy everything I do more, too. I need to focus on habits, not goals. This is probably the biggest lesson, and it came from reading James Clear’s book Atomic Habits. In his work on the science behind habits, he draws this conclusion: “We do not rise to the level of our goals; we fall to the level of our systems.” This doesn’t mean there is no place for goals and goal-setting; I still have them. But to accomplish the important things (health, finances, relationships, business, hobbies, etc.,) our goals aren’t enough. In 2019, I am making a much more deliberate effort in breaking old, bad habits and creating new, healthy ones. I’m focusing on the process of starting small, setting up cues and rewards, and tracking them daily. (This is another place where the positive use of technology plays a role!) My big goals are broken down into quarterly ones, then weekly ones, and–ultimately–incremental, tracked, daily habits. And this structure can apply to any goal you might set, even your goals as a digital parent! Rather than bore you with my long list of habits (and it’s kinda long…), I want to share a few of my goals as they relate to you and the ParentingDigital blog and community. Continue serving fellow digital parents by creating helpful, relevant, and frequent written and video content for the blog, Facebook group, and other possible channels. Write and publish a useful, actionable book on managing screen time in your family. Create an online course that walks parents through the process of building a balanced, digital home. Launch a podcast to highlight interviews with experts and practical information and ideas. I’m sharing these as an encouragement to you and what you can look forward to seeing this year. Just as important, though, I’m sharing them for accountability. Nothing like telling a whole bunch of people what you are planning to do, huh? And you have my permission to hold me to it and ask me about any of these. With that, I wish you all the best in finding balance and raising digital kids in 2019!